Morris Disease was named after the first victim, little Lisa Morris, age 8. A variant of measles, Morris Disease is highly contagious, often fatal, and has the additional terrible feature of resetting the body’s immune system. Anyone who catches Morris Disease, even if they survive the initial infection, no longer has immunity against any previous disease they have caught or been immunized against. Humanity faces perhaps its worst pandemic: a disease that either kills you or opens the door for something else to do the job. Dr. Isabella Gauley, pediatrician and aunt to Lisa Morris, is devastated by her loss. She wants to change the world, provide a place where children will never again be cursed by virulent diseases. 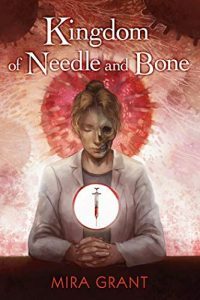 In the novella, Kingdom of Needle and Bone, we read of her efforts to create an island sanctuary, one where children can grow up safely, without fear of Morris Disease, or measles or whooping cough or any of the other illnesses that have been humanity’s constant companions throughout history. Mira Grant books tend to walk on the horror side of the sci-fi/fantasy genre. I will confess, I spent much of the time during my reading of this novella waiting for the other shoe to drop. I do not want to give away any spoilers, but I will say that this is not just a nice little story about survivors of a pandemic creating a new world for themselves. Kingdom of Needle and Bone is a Mira Grant book, and monsters are waiting for the unwary reader. This is a short book and an easy read, but be forewarned: the effects of the illness on a child are described in detail. This may not be the best choice for a bedtime story for your little ones, unless they are hoping to grow up and become virologists. It is a well crafted story, though, in both plot and characters. It is also one that provokes thought. Kingdom of Needle and Bone may only have a little over 100 pages, but it probes deeply into questions of medical ethics, wealth and privilege, and how decisions about the future of the species should be made.